Today was Fantastic again,and I didn’t get to ride, I promise I will ride tomorrow. The very few last nice and clear days here in Salt Lake to Ride my HOG and I missed it. I will ride tomorrow, I promise, I promise, I promise. 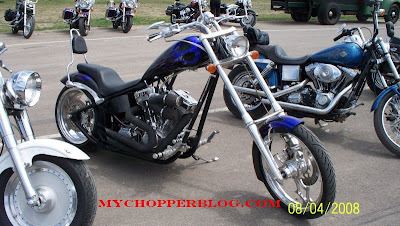 Until then here is a shot of a bike I saw at Sturgis. Just one of the many machines I snapped a picture of. I will some day get the time and money to build a custom bike until then I will keep staring and all the wonderful bike I encounter. With each bike I see a few clues of things I like and other things I am not so sure of. This one is interesting, the way the pipes are all wrapped in black heat tape give the machine a different look compared to big, swoopy, shinny chrome, pipes. The frame is clean and tall, the blinkers and controls are neat. I like it and could see myself zooming down the road on it. Today was warm and sunny and nice, and I missed out on a ride. That about all I have to say, I missed out on a nice fall ride around the valley in the sun. It was colder than it looked but would have been nice for a spin around the valley. I saw hundreds of other bikes out so, I am glad many other got to ride. Harley were thundering all around the park as I hung out with the Kids at the Draper Skate Park. Most rider were wearing coat and gloves and hats, even if the outside temperature was in the 60's it's cold going fast on a big motorcycle. Well I shall live to ride another day, like maybe tomorrow. Yup's that's a good idea, let's see what the morning brings. What a nice ride today. COLD, and I mean Cold, morning ride but it was clear and clean and crisp to the Nth degree. I warmed up after an hour or so. The Lunch time ride to the kids Skate Park and the after work ride were fantastic. I hope for another good day tomorrow, all looks well so see ya on the road. BRRRRR!!! !, It’s the end of the Harley riding season. I am bummed and cold this morning. It's snowed all weekend here in Salt Lake City, and this morning it is 32 degrees and almost snowing again. For me this is too cold to ride the Harley to work. The thought of putting the Road King on blocks for the winter is terrible. I know I will have a few more days of 'Indian Summer" to ride but today officially marks the change of the seasons. So all of you lucky people in warm climates rejoice as I start the long cold winter here in SLC. Dreaming about my past Strugis trip. I was just stiitng here thinking about how he weather is turning colder, and the long summer days of riding are fading fast. I was thinking I needed to spend the time to document my Strugis Trip. That is when I stumbled on a book called Detours: Life, Death and Divorce on the Road to Sturgis. This one sound like it sums up all the details of life and the distraction that keep us home. I checked out the Book on amazon.com and was able to read the first dew pages. I was hooked, I can't wait to get the book and finish it. From the comments it looks like a book that everyone who has headed out on a long Motorcycle Road trip can relate with.